Passing through the secure gated entry you immediately feel a sense of tranquillity, setting the tone for what this impressive residence has to offer. Beautifully appointed and abundantly spacious with living over 2 levels and multiple relaxation zones, you will be spoilt for choice. The heart of the home is a haven of generous proportions, flowing space and privacy, offering a versatile floor plan with a seamless connection to the outdoors. The high standard of craftsmanship flows through to the well-appointed gourmet kitchen complete with quality appliances, gas cooktop and granite bench-tops. Centrally positioned and cleverly designed to capture the stunning water vistas. Large bi-fold doors open onto the covered alfresco entertaining terrace overlooking the sparkling in-ground lap pool and spa. Perfect for enjoying the summer breezes and get-togethers with family and friends. An exceptionally sized light filled multi-purpose room, bedroom, bathroom and work from home office with separate access complete the downstairs appointments. The grand proportions of this home follow through to the upper level. Boasting a magnificent master suite with luxurious ensuite and superb WIR, living zone, 3 incredibly generous sized bedrooms and bathroom. A study nook adjoining the lounge area is the ideal space for the children after school. Your own piece of paradise comes complete with 3 car garaging, one with drive-through access, workshop, additional off-street parking and multiple storage areas, further enhancing the appeal of the property. 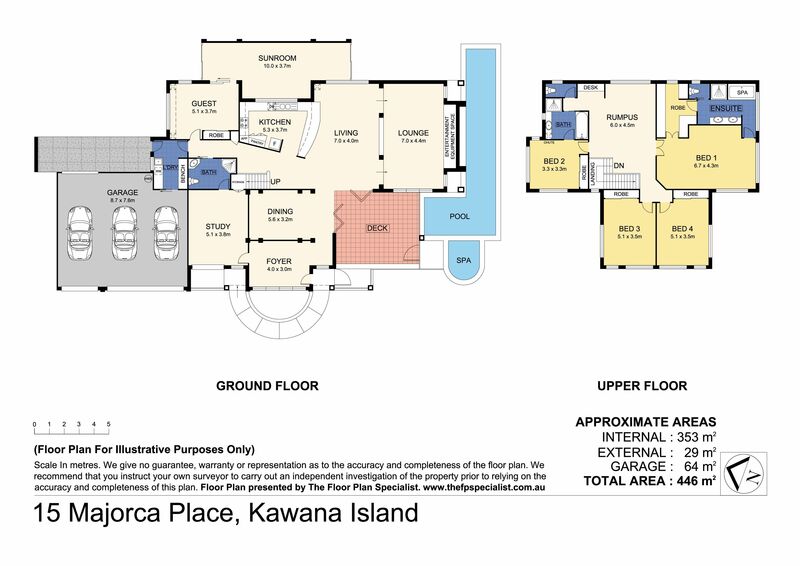 Perfectly placed on a large 790m2 corner allotment toward the end of a quiet cul-de-sac, the property maintains easy access to all that Kawana Island has on offer; parks, beaches, convenience store and award-winning restaurants. Relaxed leisure based living is the focus as you explore the natural surrounds and beauty of the island on one of the endless cycle/walking paths on your doorstep. This fabulous location also has the added benefit of being placed within close proximity to shops, schools, Sunshine Coast University Hospital and a myriad of exceptional entertainment and recreational facilities. Ultimate family living in the heart of Kawana Island – this impeccable residence deserves your inspection – call Karen today! Expressions of Interest closing 22nd April at 5 pm.